Put on your walking shoes or helmet because Every Metre Counts! St Raphael Catholic School students celebrate a Bike to School Week event. Image courtesy of A. Brown. This October, the Every Metre Counts website will launch as part of International Walk to School Month activities. What is Every Metre Counts? Every Metre Counts is an online hub to find information to help you walk or roll to school or the bus stop. While the site is mainly geared to the school community, anyone who wants to stay active can check it out and get moving. Need to know how far it is to your school? Click on the walk and roll map, find your school name to see if it will take you approximately 0 to 5, 5 to 10, 10 to 20 or 20 to 30-minutes to walk to your school. Yes, it will. While there are many reasons for parents and kids to walk and roll together, there is also a friendly competition between school boards and individual schools. And, since the information you enter is available in real time, you can see your impact right away! 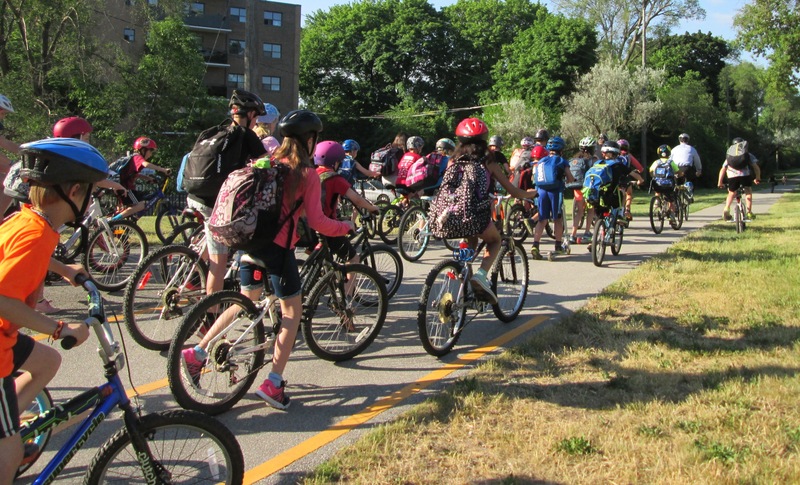 Lakeshore Public School students ride to school along Burlington’s Centennial Pathway. Check out the site’s calendar highlighting upcoming activities. November’s activity is to organize an anti-idling campaign. If you’re in Burlington and need resources for your campaign including posters, bookmarks, stickers or to borrow a large outdoor banner that can be attached to a fence on school property to remind drivers to turn off their engines, contact me at environment@burlington.ca. Take Action Burlington. Let’s encourage our youth to walk or roll to school for their health and our environment. Collectively, we can make a difference. Don’t throw out your child car and booster seats. Recycle them!